There were four high-scoring South SFA Regional Challenge Cup first round ties played last weekend with two on Friday evening and the other two on Saturday. Although Gretna 2008 managed to score the same amount of goals in their match against Mid-Annandale the Lockerbie side managed to find the net on two occasions and in fact held a half time lead. Nathan Muir opened the scoring for Mids ten minutes into the match but 11 minutes later Ian Anderson levelled the tie. Before the break Denver Milligan latched onto a mistake by Gretna keeper Vinnie Parker to give his side a slender lead to the home side at the interval. However it only took Gretna a minute after the re-start to equalise when Scott Milligan scored and in the 64th minute the visitors took the lead for the first time through Sam Aitchison. Twelve minutes from time Milligan secured victory from the penalty spot to end the scoring. The two cup ties played on Saturday again saw the winning sides scoring four goals each with St Cuthbert Wanderers seeing off neighbours Fleet Star 4-1 and Threave Rovers taking four off Wigtown and Bladnoch at Trammonford Park with the home side only replying twice. At St Marys Park Star were holding Saints to a one all draw with Roman Soltys opening the scoring after 14 minutes for the home side and Steven Hogg levelling the tie 11 minutes later. Saints though came out for the second half with all guns blazing and after six minutes Stuart Maxwell gave them the lead followed a minute later with a goal from Andrew Donely. 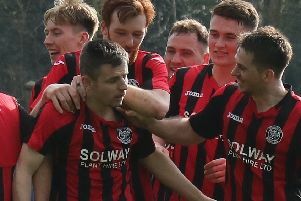 With 15 minutes left Maxwell found the net again for his second and his sides fourth to ensure victory for Saints to progress to round two where they will meet Stewartry neingbours Threave Rovers victors over Wigtown. There were four South of Scotland League matches played on Saturday with Edusport Acadmey increasing their lead at the top to five points following a 5-2 victory over Heston Rovers at Palmerston Park although finishing the match with ten men. Crichton started the day in second place only two points behind Edu but a 4-3 reverse at the hands of Creetown saw them slip to five points behind. Crichton were cruising with a three goal lead until the home side fired into life. Goals from Ben Herries, Scott Philips, Stewart Taylor and an own goal saw the home side take the three points from an exciting encounter. Upper Annandale took a two goal lead against visitors Newton Stewart before the Creesiders fought back through Scott Whannel and Johnny Fisher to level the match. Fisher gave Newton the lead just before the finish but Uppers found the net for a late goal to deny the three points from the visitors. Goals from Kieran Kreuse, Blair Steele and Cammy McDougal penalty was enough for Lochar Thistle to record a 3-1 victory over Nithsdale Wanderers at Sanquhar.